Healthcare and technology are changing faster than we can keep up. As leaders, our jobs have become more difficult than ever. If we do not change the “way we have always done it,” the “it” will lead to our demise. Being ready for change is not enough; we need to be leading change. Change can make our lives as leaders easier, but we must move the change in the right direction. My journey as a leader really changed when I received this comment in my 2015 employee engagement survey: “Lori needs to know what she doesn’t know.” At first, I will be honest, I was a little angry. The longer I thought about it, I found it a little funny, but it began to haunt my thoughts. What were they trying to tell me? The statement changed the way I lead today. I now think very differently about my personal goals. Each year I set new goals that build off of the prior year’s goals. Whatever the goal, it must extend to my staff and also provide measurable benefits. It has been an interesting adventure since I arrived at Lee Memorial. I have seen my staff grow in some amazing ways, but not all staff have experienced the same growth. I started asking hard questions: Why have they not all grown? Why do they not have the same commitment? Do they even want job satisfaction? After all the questions, one theme stood out: they lacked leadership skills and knowledge. They only knew what they knew. I found that most of them did not set goals or really understand the benefits of goal setting. I decided there was real value in changing the staff’s mindset from working for a paycheck to working for personal satisfaction. If I could get them to focus on being better communicators and role models, and holding themselves accountable, how much easier would my job be? This was a turning point for me. I could now use my personal goals in a way that would develop my staff. The challenge came in finding a delivery method that would be well received. I decided on using a classroom approach. I now hold classes that meet once a week for 6 weeks. They cover multiple leadership skills from having self-accountability to becoming a better communicator. These classes have been so well received that graduates of the classes openly promote them to others. This has been very successful and has changed the way I think about my job. 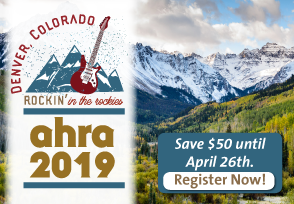 When asked what I do, I now say; “I am the Director of Radiology, but I focus on developing people.” If you find this concept interesting, I will be presenting the details of my leadership change at the AHRA Annual Meeting. My session, “Developing Leaders: How to Make Life as a Leader Easier,” will be held on Sunday, July 9 at 4:30 PM. I hope to see all of you in Anaheim. Lori Thies, RT(R), MBA, CRA is the radiology director at Lee Memorial Health System in Fort Myers, FL. She can be reached at Lori.thies@leehealth.org. Support the EF at #AHRA2017! Great article! I am looking forward to your presentation! Great read. I totally agree!